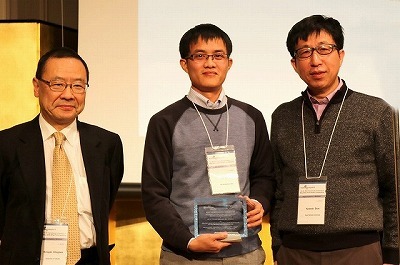 At the "IEEE International Conference on Big Data and Smart Computing" (* 1) held in Kyoto from Thursday, February 28, 2019 to Saturday, March 2, 2019,The H. Vu, a 3rd grade doctoral student belonging to the Ben-Abderazek laboratory (* 2) of our university, received the sub-Best Paper Award. 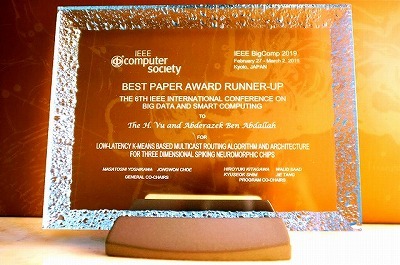 The awarded paper is entitled "low-latency K-means based multicast routing algorithm and architecture for three-dimensional spiking neuromorphic chips." This paper presents a novel multicast routing algorithm and architecture for spiking neuromorphic chips. The proposed algorithm alleviates the congestion of the overall spiking neural network system by adopting a K-means clustering scheme, which divides the network into balanced partitions. The proposed approach, when fully integrated, is expected to have a significant impact on IoTs, robotics, as well as prosthetic devices.